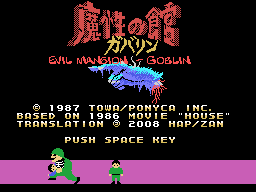 Mashou no Yakata Goblin is an action game for the MSX. This patch will translate the Japanese MSX1 action RPG ROM game “Mashou no Yakata - Gabalin” to English. To run this game in an emulator, use “Mirrored ROM” mapper type.